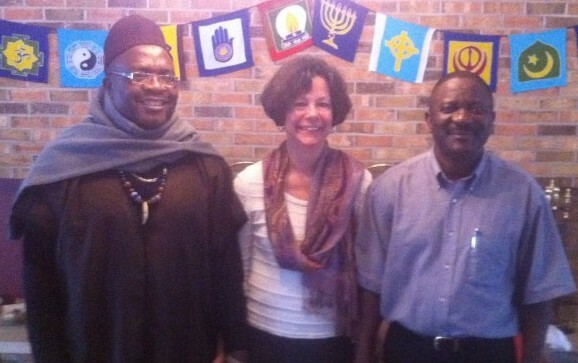 From April 28 to May 1, Chief André Flaubert Nana (above left, with French Professors Dianne Guenin-Lelle and Emmanuel Yewah) paid a humanitarian visit to Albion College to help celebrate the year of Global Diversity. He traveled from Batchingou, Cameroon, where the college’s Nwagni Project aids in operating an elementary school. The Pleiad had an opportunity to sit down with the Chief at the home of Dr. Guenin-Lelle, who helped organize his stay. This interview was conducted in French and translated into English. The Pleiad: This year’s theme is global diversity. Students are able to learn about Africa, specifically Cameroon, because of your visit. On the subject of diversity, can you talk about how Cameroonians approach diversity between local villages or cities? Nana: Cultural diversity assures that Cameroonians still look for culture. In Cameroon, we have a lot of people going to big, metropolitan places. In these metropolitan places, the teaching is not based on cultures from every Cameroonian village. It’s what uproots a lot of kids from the country. Today, when you talk about cultures and when you organize cultural ceremonies in Cameroonian villages, it’s a good idea to show those traditions. P: What are some of your first impressions of Albion and the college? N: My first impressions of Albion and the college are really good. Even in the elementary schools. It’s a very good culture — the behavior of teachers, the behavior of students, the behavior of parents in the city. It’s very appreciated. P: Why did you choose to visit Albion on your first visit to the United States? N: I chose Albion because the adults and ancestors of my village brought Albion College students several times to Batchingou. Albion started the project in Batchingou. Today, I was invited by Albion College to come visit Albion. It’s the greatest gift of my life. P: Is there anything specific that you want to gain from this trip? N: All I want to gain from this trip is the warmth of the hearts of all the people of Albion, all the administrative authorities of Albion, all the political authorities of Albion, all the religious authorities of Albion. It’s all so that they can work together to try to see how they can help my village. P: Can you talk about the relationship between you and the people in the village? N: What I can say about the relationship between the Chief and the population of the village is like a husband in Albion, for example, but the only difference is that it’s more humane for us. It’s not about salaries and money. We work like partners with our population, and we try to change things in the village. If someone is hungry, we share ideas – someone can grow something to give to whoever doesn’t have anything to eat. Today, we know that evolution [in society] asks that behavior changes from one time to another. We want people to gain from development, but development associated with our culture to make our culture better. A lot [of power] rests with us, but while working with everyone [in the village]. P: When I was in Cameroon, I found a lot of differences between the American and African education systems. Today, you visited schools in Albion, so what did you see? N: I found the same differences that you found. I know that there are truly differences between educations here and in Batchingou. But if someone were to ask me, “What is your wish?” I would hope to divide some things here for Batchingou. It would be so that the kids [in Batchingou] could be at the heels of the kids here [in the United States]. P: While working with the Nwagni project and the college, what are some goals for the village? N: I want to use a small parable from Batchingou: You know that to tend to a good farm, you always need to have a place to house the materials so that the next day, you can continue to tend to the farm. So, for me, where we would house the cultures of Albion and Batchingou today would be in a museum. We could keep all of the images, have conference rooms, have libraries, have everything so that when kids leave Albion, they can come see everything given to Batchingou. All of that – a good museum to protect all of your contributions would be great. A type of heritage box to house the value of our culture. P: Do you often communicate with students in the Nwagni Project to maintain that relationship? N: To communicate, it was me and Dianne [Guenin-Lelle] through Emmanuel [Yewah]. Actually, I think that when I leave I’m going to leave my email. Students would have my email to communicate directly with the students of Batchingou. Technology is really well developed here. Each time that your schools have to get rid of computers, they could send those back to Batchingou for the schools or museum. The internet is now possible in Cameroon, even in Batchingou. With email, the kids could communicate with their friends, and even the parents could communicate with people here. They could send pictures of what’s going on in Albion and Batchingou. P: What is the most challenging problem facing the village? N: You know, you’ve already started. If I were to talk about the biggest problems of the village, all anybody would understand is that the biggest problem in Cameroonian villages is poverty. We can’t ask people to contribute money for us to share in Batchingou. It’s just trying to see how to create business from Albion in Batchingou. If that were to happen, Batchingou could work with Albion to commercialize their products. In the end, some of the money would stay in Albion, and some of the money would go in Batchingou’s pocket. We have some plantations, and if they were mechanized, that would generate some money. We have an aqueduct that flows water from high up and it hoses everything, and then we can put those agricultural products on the market. I saw some carrots in a salad here, and we could put something like that in Batchingou to sterilize carrots, tomatoes, whatever. If Albion came, we could choose water that is fitting and then bottle it. In Cameroon, people need water. In countries like Chad where it’s really hot, they need water. In Mali, they need water. So, we could produce water and then sell it everywhere, and that would generate money in the village and help the village to get out of poverty somewhat. P: And, to finish, how can Albion College students help the village and the Nwagni Project? N: The students have already started, and it’s too kind. We have some middle schools that we need to build in the village. After elementary school, those students need to begin middle school. If we could find some teachers from Albion College who could teach American English in Batchingou, that would prepare the students at elementary school. They could then be sent to middle school. After they finish their studies in Cameroon, they could continue to study at Albion. They would be useful in the village, they would be useful in the United States, they would be useful almost all over the world.